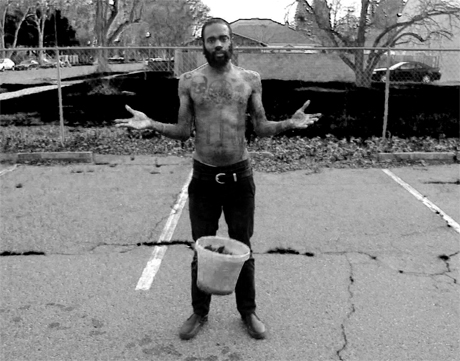 Earlier this year, Sacramento-based doom rap crew Death Grips told us that they'd release a follow-up to their Epic debut The Money Store before the year was over. Originally called No Love, a new report indicates that the album is now called No Love Deep Web, and will most likely drop at the end of October. In a statement released to Pitchfork, the band announced many details about the upcoming record. All of the beats were performed live by drummer Zach Hill. The album will be mixed in Shanghai, and the sound is described as "cold, bass heavy, minimal, rock & roll influenced and could simultaneously fit into a rave or dance club context." In addition to the recordings, the band is currently in correspondence with cult film icon Crispin Glover, who will likely collaborate with Death Grips on a video project related to the album. we are working on 20 tracks and looking to narrow down to 13.
it will be released by epic records in the us and columbia in the uk. the release is scheduled for fall 2012. most likely late october. we are in correspondence with Crispin Glover and working toward a video collaboration with him relating to this album. we've been recording the album primarily in sacramento , ca. and oakland , ca. for the past five months. we will be mixing it in shanghai , china. the beats are being played live on a roland electronic v-drum set or acoustic drum set by zach. there are no features , guest collabs or outside producers. the material is cold , bass heavy , minimal , rock & roll influenced and could simultaneously fit into a rave or dance club context. it is essentially rap and electronic music while at times extremely aggressive. we plan on supporting this release live internationally. *the track that comes out sept.10 as part of the adult swim series is a previously unreleased track from the Money Store and is totally unrelated to the new album NO LOVE DEEP WEB. NO LOVE DEEP WEB is another sound and vibe entirely.